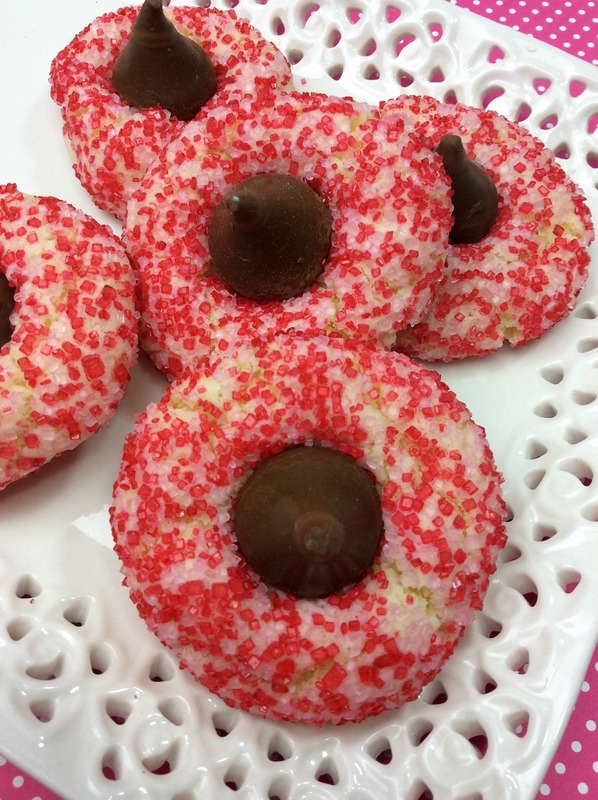 Looking for a Hershey Kiss Cookies recipe? 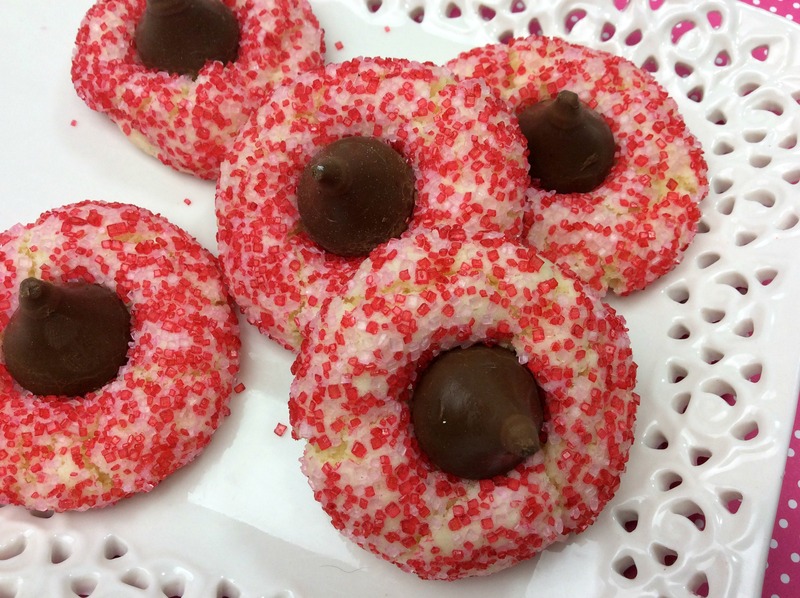 You are going to love Hershey Kiss Sugar cookies that are perfect for Valentine’s Day. Enjoy this classic cookie recipe any time of year. Who doesn’t love cookies? With chocolate on top? With delicious sprinkles around the sides? I mean come on. This might become your favorite cookie recipe to make any time of the year. 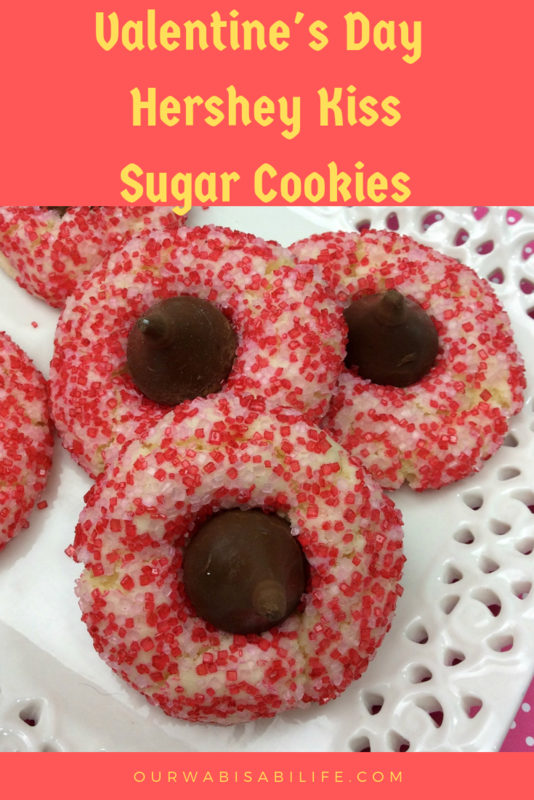 A great way to celebrate Valentine’s Day is with Valentine’s Day sugar cookies. 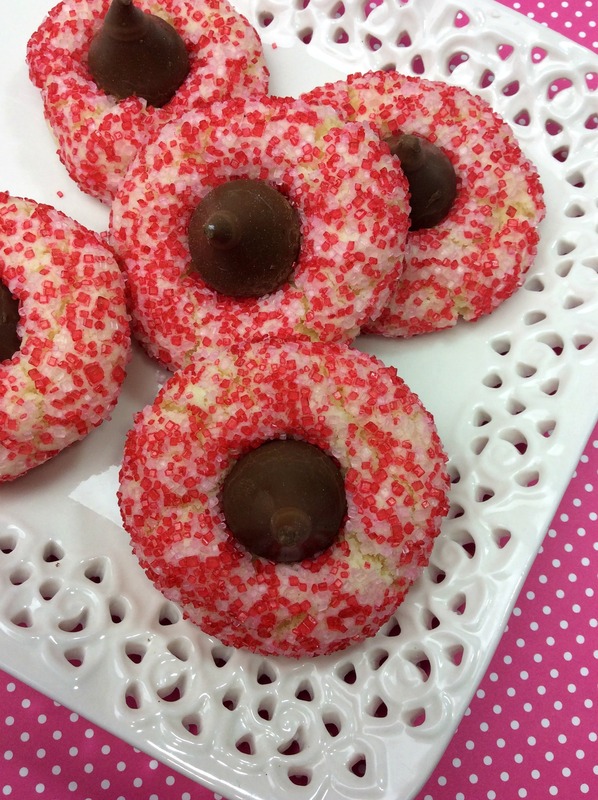 These cookies are a bit like thumbprint cookies and a bit like peanut butter blossoms. 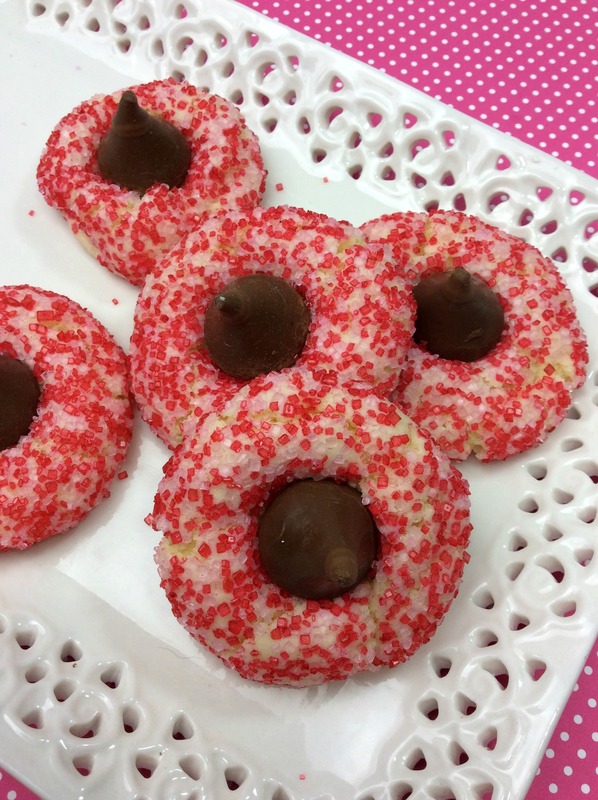 Using the sugar cookie recipe, you add some red sprinkles and a Hershey kiss on top. Just like that, you have amazing Valentine’s Day Sugar Cookies. Sugar cookies are good no matter what time of year you make them. Since my kids have discovered Hershey Kiss Sugar Cookies, we have sugar cookies often. 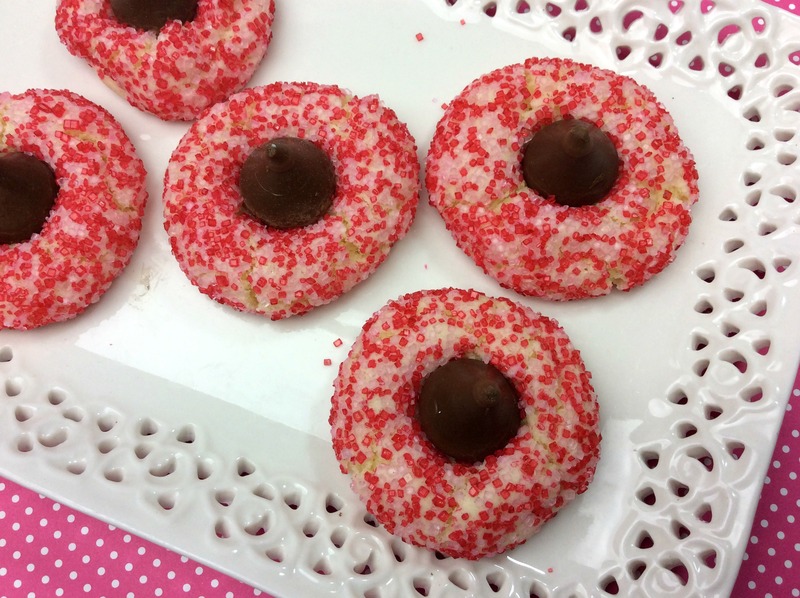 These are great tasting sugar cookies that have a Hershey Kiss on top. Of course, it is perfection. 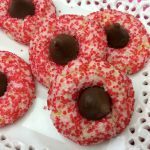 It is simple to make these Hershey Kiss Sugar Cookies for Valentine’s Day by adding colored sprinkles. What Ingredients are in Sugar Cookies? For this basic sugar cookie recipe, you will need a stick of butter, sugar, egg yolks, flour, baking powder, vanilla, and salt. Add sprinkles to the sides and a Hershey Kiss on top. While it might vary from one recipe to another, this recipe for sugar cookies is baked at 350 for 8 – 10 minutes. You will add the Hershey Kiss after baking. In a bowl of a stand mixer, cream together butter and sugar. Add in the egg yolks and vanilla and beat until incorporated. Add flour, baking powder, and salt, and mix until just combined. Roll the dough into balls slightly bigger than a tablespoon. Roll each ball of dough in sprinkles. Place each ball on your baking sheet. Let cool 5 minutes after removing from the oven. Now put a Hershey kiss in the center of each cookie.